Staphylococcus aureus, a major causative agent of human infection, produces a large array of virulence factors, including various toxins. Among them, the host RhoA GTPase ADP-ribosylating EDIN toxins are considered as potential virulence factors. Using the polymerase chain reaction (PCR) assay, we analyzed the virulence profile of 256 S. aureus isolates from various clinical sites of infections. We developed specific primers to detect the three isoforms of edin-encoding genes. We found a prevalence of 14% (36 bacteria) of edin-encoding genes among these clinical isolates. Strikingly, we found that 90% of all edin-bearing S. aureus isolates carried the type-C allele. Both the spa types and the profile of virulence factors of these edin-positive isolates are highly variable. Notably, we show for the first time that edin-C-positive isolates were more frequently recovered from deep-seated infections than other types of infections. 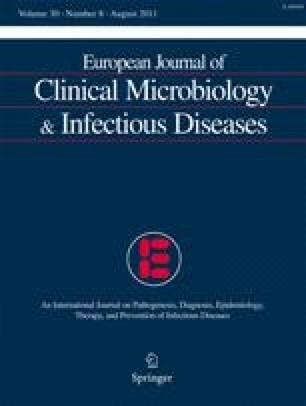 Our present work, thus, strongly suggests that the presence of edin-C is a risk factor of S. aureus dissemination in tissues and, thus, represents a predictive marker for a pejorative evolution of staphylococcal infections. We are grateful to Fernand Girard-Pipau and Prof. Claire Poyart for providing the various strains of Staphylococcus aureus and Prof. Jean-Louis Mege for the critical reading of the manuscript. Our laboratory is supported by an institutional funding from the INSERM and a grant from the Agence Nationale de la Recherche (ANR R07113AS) and the Association pour la Recherche sur le Cancer (ARC 4906).